After gaining lots of very useful contacts from the House of Representatives, I have discovered that the much-touted supermajority has finally started flexing its legislative muscles. Inday, ilabas na ang chopping block! Yes, the wheels have started turning and the public is very happy with the development, but let’s not lose sight of the forest for trees, because it appears that Trillanes’ expulsion from the senate is just a small part of a series of moves in what appears to be a chess gambit. That is, a series of events, starting with Trillanes expulsion, will lead to a political chain reaction that may virtually annihilate any significant level of power that the Liberal Party has today. Note that this will not be an article about what should happen. It is instead about what will likely happen in the Philippine political scene, an arena that’s has so far been more lively and exciting than even the sappiest Mexican telenovela. In Sunday’s “Gordon’s Ethics Complaint: Recent discoveries suggest Trillanes is toast”, I explained how Gordon’s ethics complaint will have the support of a least 13 senators, with the vote of Senator Grace Poe OR Senator Win Gatchalian being the crucial 14th vote to complete the two-thirds majority required to expel Trillanes. There will only be 20 or 21 senators who will vote on the complaint. Gordon, however, said yesterday that he has the support of 14 or more senators, so it appears that Gordon may have secured the Gatchalian’s support. A highly-placed source from the senate independently confirmed that Sen. Gatchalian is very likely to support Gordon’s petition. So yeah, it seems that Gordon isn’t bluffing. While some netizens tell me that this should have been filed a long time ago. But then, remember that a certain Abelardo de Jesus filed an ethics complaint against Trillanes back in March 2017, and it didn’t gain any traction [ABS]. That is, I think Gordon’s complaint was filed at just about the right time because it gave Trillanes enough time to piss off a sufficient number of senators. As far as I am concerned, it’s just a matter of time before Trillanes, along with his horde of consultants, bids the Senate goodbye. Trillanes’ pending exit, along with Sen. Leila de Lima’s detention and Sen. Alan Peter Cayetano’s resignation, will put the total number of active senators to just 21. Thus, the original two-thirds majority from 16 (based on 24 senators) will be reduced to 14 (based on 21), making convictions in impeachment trials much easier to achieve. As I have explained in my 26 August 2017 article “Andy Bautista exit more likely after Hontiveros kidnapping stunt”, there are eight would-be senator-judges who are likely to vote “acquit” in a prospective impeachment trial and that one of them is Trillanes. If Trillanes exits the senate, the maximum number of “acquittal” votes will be 7. Adding the fact that only 21 will be voting, Trillanes’ exit makes a “sure acquittal” scenario impossible. Now, let's set that aside and talk about Andy. Ombudsman Conchita Carpio-Morales is set to retire in July 2018, or barely over ten months from now. Honestly speaking – and I believe most congressmen will agree with me – I think that impeaching Carpio-Morales will be a waste of time for the simple reason that she’s about to exit anyway. Meanwhile, I have read the verified complaint for the impeachment of Comelec chair Andy Bautista filed by Atty. Ferdie Topacio and former Negros Oriental Rep. Jacinto Paras. You can read for yourself by clicking here. Among the four or so grounds for impeachment cited, I believe that the fourth ground – SALN misdeclaration – is more than enough to get Bautista convicted in a senate impeachment trial. A source, who’s part of the HoR leadership, told me that Bautista has sent feelers to the office of House Speaker Pantaleon “Bebot” Alvarez. That is, Bautista supposedly informed the House leadership that he is intending to resign from his position soon. There are two verified complaints for the impeachment of Chief Justice Lourdes Sereno: one filed by Atty. Lorenzo “Larry” Gadon, and another by the non-government organization Volunteers Against Crime and Corruption (VACC). So far, Gadon’s complaint has been endorsed by 25 representatives [GMA] while 16 endorsed that of VACC [Inq]. Interestingly, another senior HoR source told me that a large number of representatives have volunteered to endorse these complaints but the House Speaker told them not to sign them yet, and for good reason. You see, I checked the executive summary of Gadon’s complaint and the number of grounds cited is mind-boggling. For example, Topacio’s 22-page impeachment complaint against Bautista cites only four or five grounds, while Gadon cited TWENTY SEVEN. By simple ratio and proportion, Gadon’s actual complaint must’ve been almost a hundred pages long, and that’s not even counting the annexes! Using public funds to finance an extravagant lifestyle, including booking opulent hotel rooms, flying on first class, and having large contingents during official foreign visits. Suffice it to say, submitting this lengthy complaint as it is, may result in a senate trial that’ll last forever. You can check the executive summary of the impeachment case against CJ Sereno by clicking here. Yeah, I appreciate Bebot’s prudence because there’s no point in hearing all twenty-seven grounds, as proving just one ground will be enough to remove Sereno from the judiciary. According to another HoR source, Supreme Court associate justices who have grudges against Sereno very willingly provide the evidence for her impeachment case. The source even told me that one of the associate justices keeps on calling a senior congressman to ask the latter about the progress of the complaint. With that said, I am confident that the proponents of the impeachment case against Sereno will find no trouble in looking for evidence. Adding the fact that the pro-Sereno Senate minority bloc lacks numbers, I can confidently say that Sereno, like Trillanes, is toast. The first – and probably the most important – impeachment complaint filed in the Lower House is against VP Leni Robredo, yet it’s the one that has apparently gained the least traction. According to another HoR source, it’s because the supermajority has never really tested its cohesion, that most house members are scared of endorsing the complaint because of potentially cataclysmic reprisals from the Liberal Party, if and when the latter regains power, e.g. in 2022 when Duterte steps down. Sereno and Bautista’s removal, made more likely Trillanes’ expulsion, may encourage the representative to temper their fears. That is, Sereno and Bautista will serve as the guinea pigs – the laboratory rats – so the HoR can see how far it can go. That is, the removal of these two can embolden the congressmen to support the impeachment case against Leni Robredo. Yes, if Trillanes, Sereno, and Bautista go bye-bye, Leni will probably go bye-bye too. 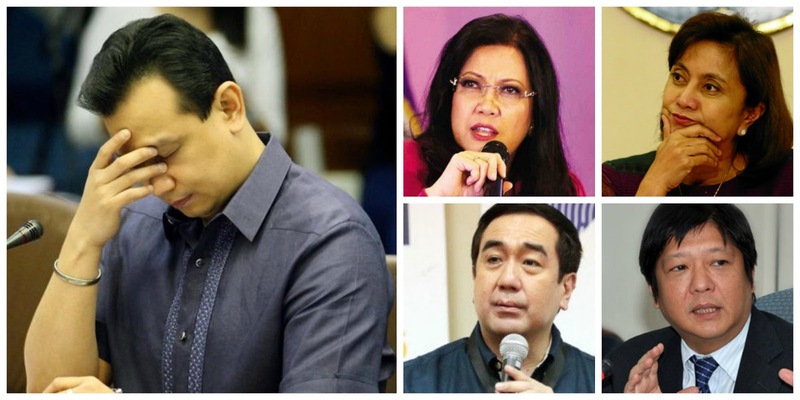 Interestingly, Sereno, Bautista, and Robredo share at least one common denominator: Ferdinand “Bongbong” Marcos, Jr.’s (BBM) pending electoral protest. First, Bautista reportedly conspired with Senator and losing VP candidate Francis “Chiz” Escudero to transfer the latter’s 2016 votes to Robredo, allowing the latter to win over Marcos by a hair’s breadth [FB]. Second, Sereno has seemingly been finding ways to further delay the progress of BBM’s electoral protest case. In my article “#OustDuterte: Leni, Lourdes, Loida, LP, and Plan 0117”, for example, I explained how the Sereno stalled by delaying the preliminary conference on the BBM protest case. The preliminary conference, which should have been held in late August or early September of last year, was held almost one year later in July 2017 [CNN]. Third, Robredo, obviously because she’s the respondent in the BBM electoral protest case. Let me tell you why this is relevant. By removing Trillanes, the senatorial roster will be down to 21, so that the required two-thirds majority conviction will be easier to obtain, i.e. it’ll be easier to remove Sereno, Bautista, and Robredo, assuming that none of them will resign before that happens. By removing Bautista, it will be easier for BBM to access Comelec records because Bautista isn’t there to cockblock him. It will also be easier to subpoena Bautista because he cannot hide behind his powerful Comelec throne anymore. By removing Sereno, a speedier trial on the electoral protest will ensue, as Sereno won’t be there to delay the proceedings anymore. No more waiting for months and months just to wait for even more months and months. By removing Leni Robredo, the prospective ex-VP will run out of reasons for delaying the case. For one, she cannot use the “I don’t have money” alibi [Inq] anymore, an alibi that she has used to further delay the proceedings. After all, Robredo’s removal implies her becoming a private citizen again, i.e. she will be able accept donations without many legal roadblocks. In short, the removal of the three will speed up the BBM case. Speeding up the protest case is essential for BBM because he may need to have it resolved before May 2019, i.e. the 2019 senatorial elections because he will suffer from the “Defensor Doctrine”, after some highly-placed sources in Malacañang told me that BBM plans to run for senator in 2019. DEFENSOR DOCTRINE: In Defensor vs Ramos [P.E.T. Case No. 01], the Presidential Electoral Tribunal ruled that the late Senator Miriam Defensor-Santiago’s 1992 electoral protest case against then-President Fidel V. Ramos has been rendered moot and academic after Defensor-Santiago ran and took office as Senator in 1995. That is, if BBM runs for senate in 2019 and takes office, his electoral protest against Robredo, where he has paid P66 million so far [CNN], will be dismissed. Thus, removing Sereno and Bautista is well within BBM’s political interests, whether he admits it or not. Some may argue that the Marcoses may let Ilocos Norte Gov. Imee Marcos run for Senate so BBM can avoid forfeiture of the case. However, this comes with great political risk because many northern politicians agree that without a Marcos in Ilocos to keep the entire province together, bloody feuding among Ilocano political warlords may resume. Thus, the scenario that’s most beneficial, as far as the Marcoses are concerned, is one that involves a pre-election resolution of the electoral protest case. With that said, the timing of the Marcos Family’s offer to settle with government is fascinating, to say the least. If you can recall, I said in Friday’s “Bye-bye LP? Political implications of the Duterte-Marcos negotiations” that these Marcos wealth negotiations may translate into a Marcos Family with greater bargaining power under the Duterte Administration. Are the Marcoses supporting the removal of Trillanes, Bautista, and Sereno? I can try to ask Ilocos Norte Gov. Imee Marcos about it, but will she dignify that question? Of course, not. I wouldn’t if I were in her place. Regardless, what’s clear here is that at the end of the day, what we might see is a real life chess game that will put Kasparov, Spassky, and Fischer to shame.